Hulmet is a a small game where your objective is to get through each room of the level in your own way. Wether it's killing every enemy or avoiding all of them, picking upp every upgrade or going through the level as fast as you can. Outside of just getting through the level you can try to gain as much score as possible, you're rewarded with many different types of bonuses based on what you did in the level. I've never really made art before so this is my first real try at making it, so I decided to go small and I ended up having the resolution of the game to 128x128. Where can I see more of this game?! My plan is to post here on TigSource and sort of sum up of what I've been posting on Twitter during the period between the posts here. Here's also where the player end up after a round. There's a local leaderboard and also a working online leaderboard. A good thing with traveling a handful of hours at a time (which I do about 2-3 times a month) is that I allow myself to work really focused on new things that might take time. So today I made a perk system, to explain it quick it's similar to The Binding of Isaac. When you start a new game you start from scratch with nothing but 3 in health and a normal blaster pistol. So you can find upgrades in crates which you will keep between levels until you start a new game. Let me know if you have any crazy ideas for upgrades! 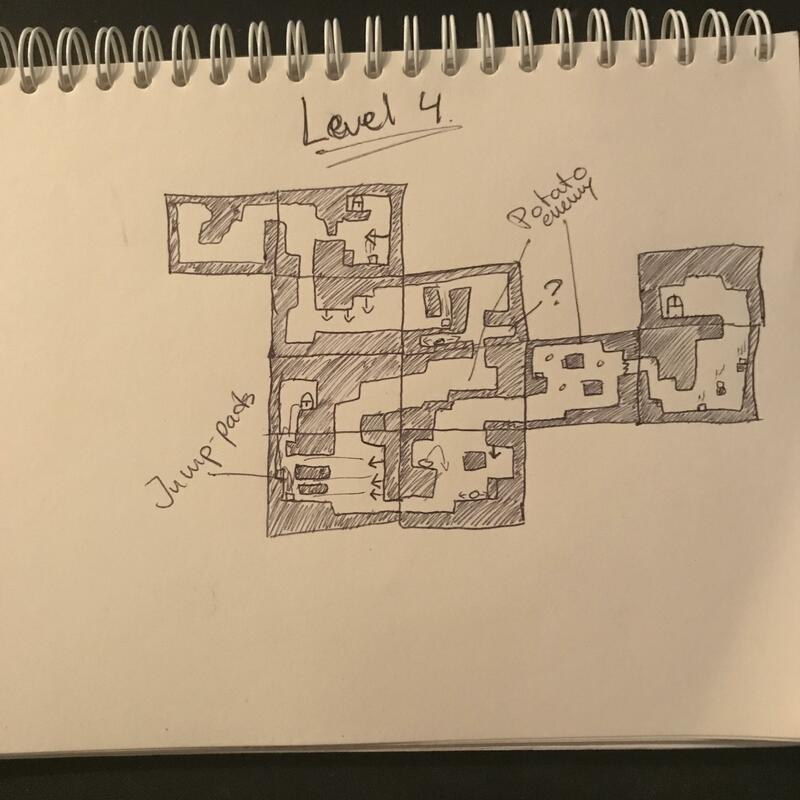 Today I made a first draft of the first level. Not entirely satisfied but it's a start. Looks great. Are the perks random? Thank you, yes the spawn from the chests are random between perks and different ammo types. Also health pickups and some sort of glow stick (for the dark areas) can also be found in a chest. I'm currently designing some levels and adding small new features such as hidden paths and static enemy turrets. I think this level might turn out more fun than I thought! Right now I'm planning on having 5-6 levels. It's meant to be a short game and if I know myself then I might come up with an idea that I can't hold myself from making.. We'll see. 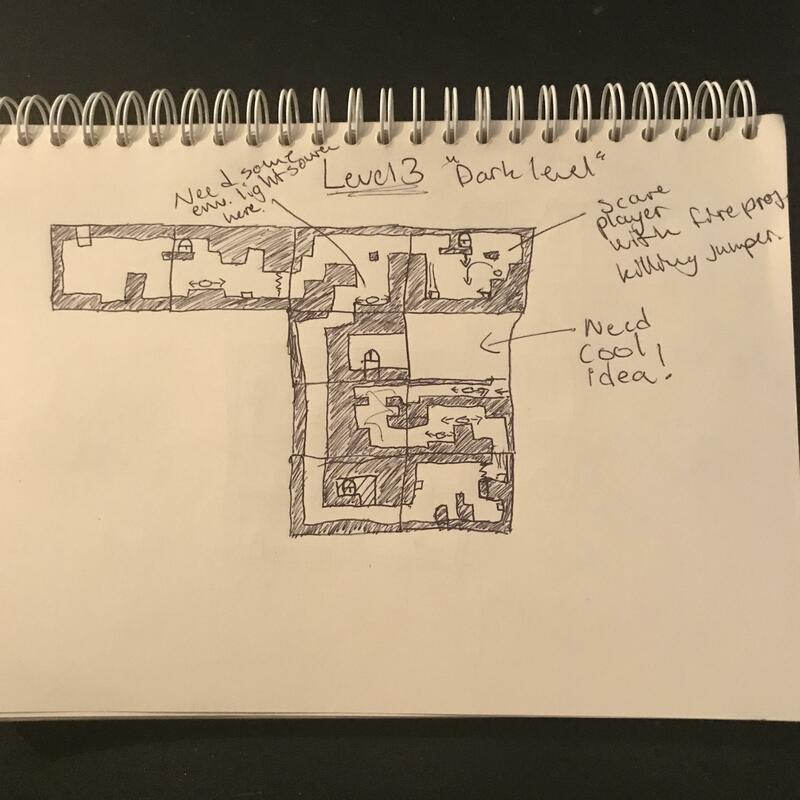 Here's a first draft of a room in a dark level. I think it could be cool if the electricity would light up the way for you! Alwa's Awakening was great, so I'll definitely be keeping my eyes on this! Thank you Zell, glad that you liked Alwa's Awakening! I don't know if anyone find this stuff interesting but I like to start off by doodling something on paper and then try to create a level out of this. 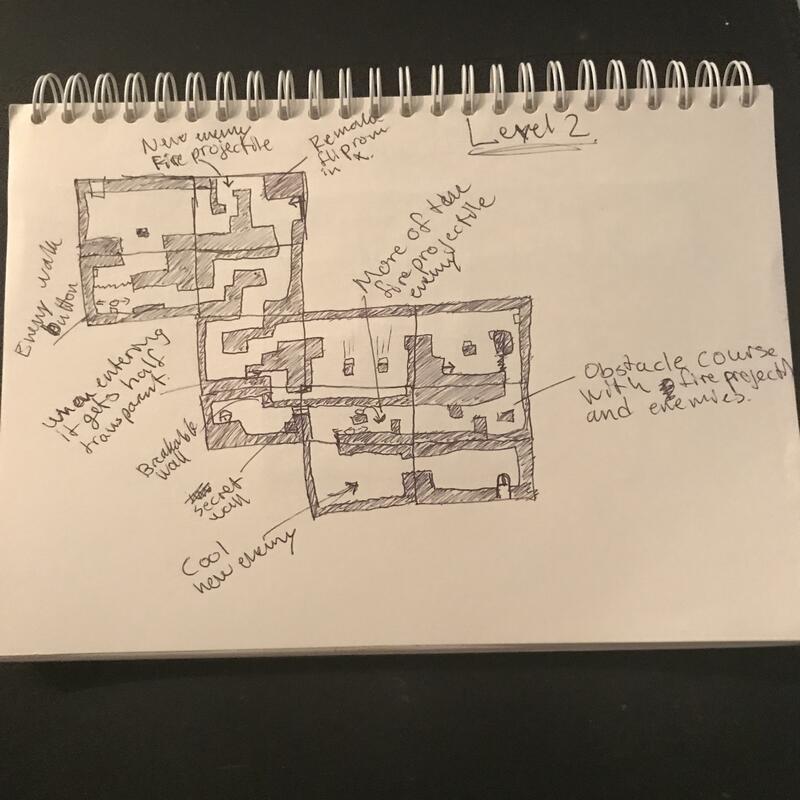 While creating the level that I've just designed on paper I like to go a bit "off-road" and try spontaneous ideas that comes to mind during this creative process. So I thought I would share some sketches that I've used. So during the weekend I tried to stream some of the development (you can find it here - https://www.twitch.tv/anderssonkev) and after that I added some feedback particles when projectiles hit something and when the player lands on the ground which turned out better than expected but I'm not fully satisfied yet. 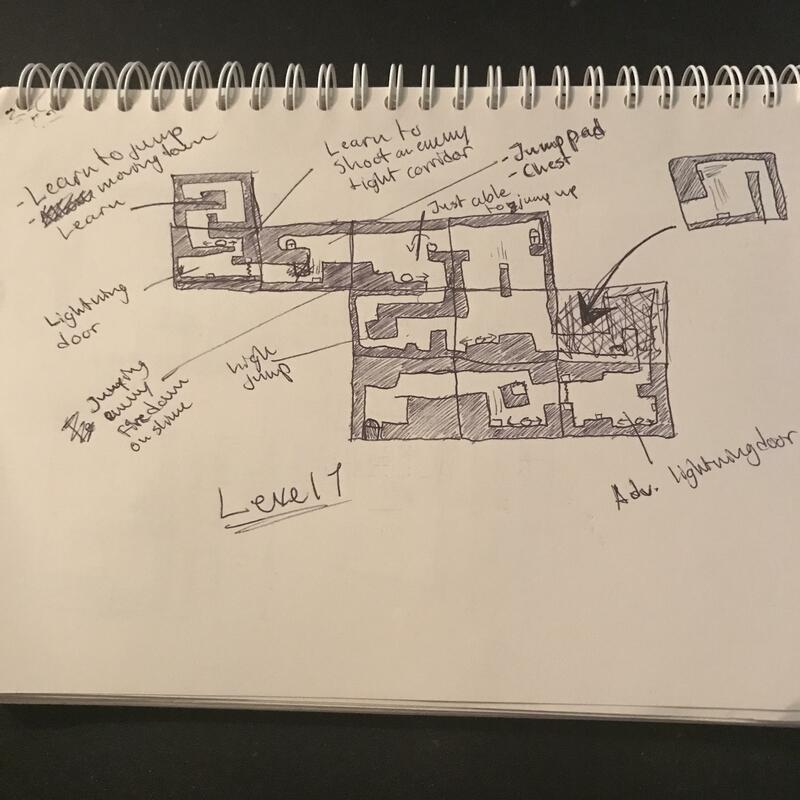 My plan is still to make a small game even though I added secret levels during stream, I think it'll be fun for those who find it. I've barely done anything this week (that I can remember), but here's a gif of one of the levels. My plan now is to finish off some minor bugs and then get a build out to some people and see what they think.